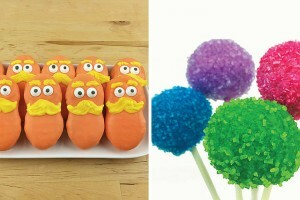 There’s Always Room for Cake and Ice Cream – Ice Cream Cake Pops! 1 Just look at them! A-dorable! I could eat a BOWL every night before bed, & actually… I used to. Seriously, every night. Ask my mom. Had to knock that off though, you know how it is. How cool are these though – cake! Posing as ice cream (and doing a dang good job at it)! Bakerella is a genius, she’s the one who originally dreamed these up. Then I just took it a step further and added a cake bite ice cream bowl! Best part EVER - no melting ice cream. 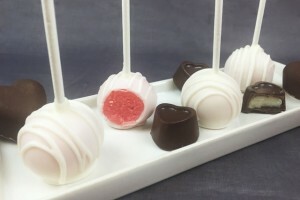 Just CANDIQUIK, taking cake balls for a quick dip, drip, and dry! Warning: this post is going to have a lot of pictures! I took a lot. I am so indecisive. HERE’S THE SCOOP (pun intended!) these are MINI. You must give your ice cream cones a trimming. 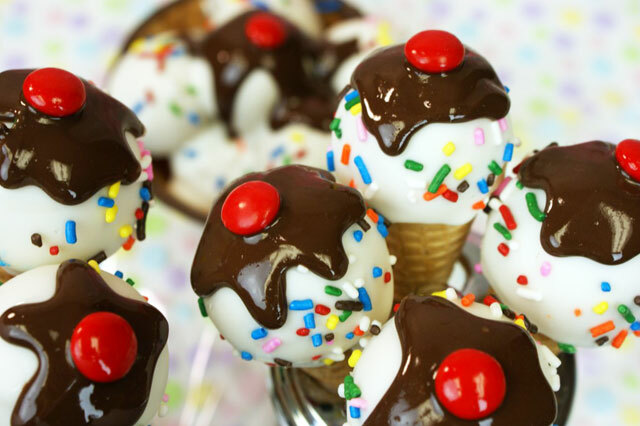 Ice Cream Cone Cake Pops! Prepare and bake cake mix as directed on box; cool completely. Crumble cake into a large bowl. Add frosting and mix thoroughly. 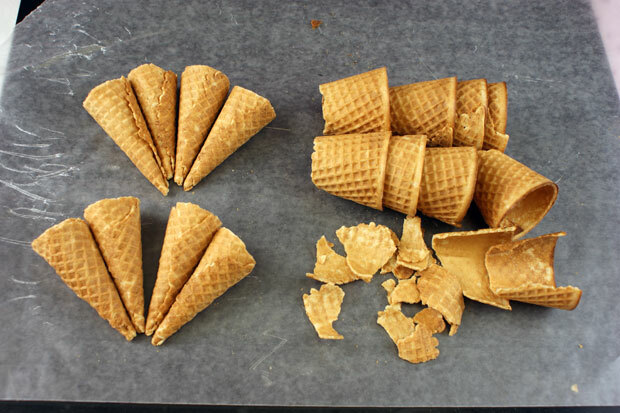 Carefully cut the top of the waffle cones off, so the cones measure approximately 2 ½ inches tall. Melt Vanilla CANDIQUIK in tray according to directions on package. when dry)! Sprinkle if desired. Stick cones into a Styrofoam block or ice cream cone holder to dry. 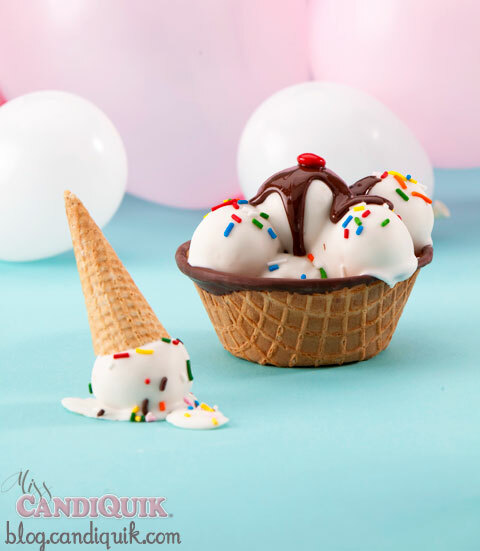 Once dry, melt Chocolate CANDIQUIK and spoon a small amount on top of each cone allowing it to drip over the sides. Top with a red M&M candy before chocolate has set. 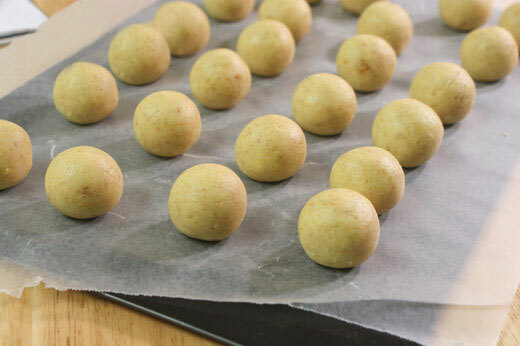 If cake balls start to fall off your cones or get gooey when dipping, return the remaining cake balls to the freezer or refrigerator until firm. Melt Chocolate CANDIQUIK in tray according to directions on package. 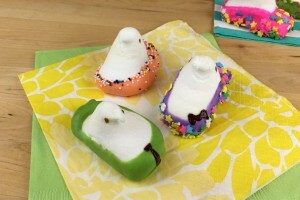 Dip rim of waffle ice cream bowls in melted Chocolate CandiQuik; set on wax paper to dry. Set Chocolate CANDIQUIK aside. Melt Vanilla CANDIQUIK coating in tray according to directions on package. 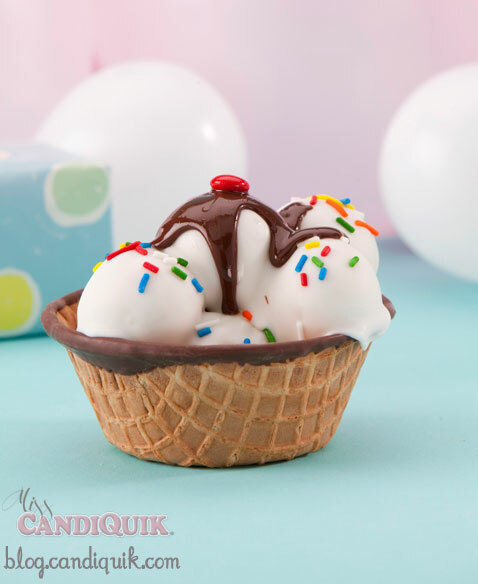 Dip cake balls in melted CANDIQUIK, and place inside waffle ice cream bowl. 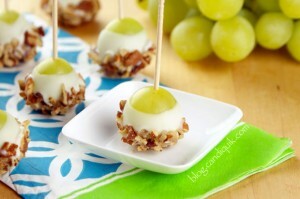 Place 5 coated cake balls in each ice cream bowl. Sprinkle if desired. 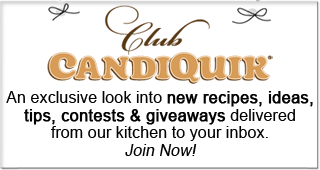 Once dry, reheat Chocolate CANDIQUIK and spoon a small amount on top of each pile of cake bites, allowing the chocolate to drip. Top with a red M&M before coating has set. OOPS! Ok - not really. 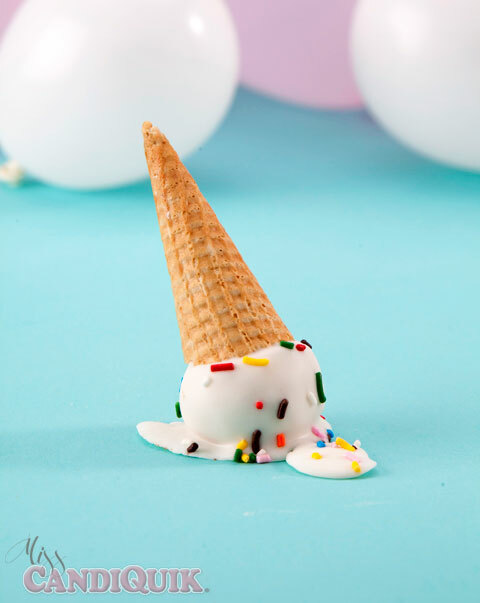 But I looove this one - dip a cake ball (the messier the better), plop ‘em on wax paper, sprinkle, and press the cone on top! You can always use sugar cones and saw the tops off using a knife. Or you can make it easier and buy the mini kid cones (I’ve only seen these in select stores and they are the ‘Joy’ brand). 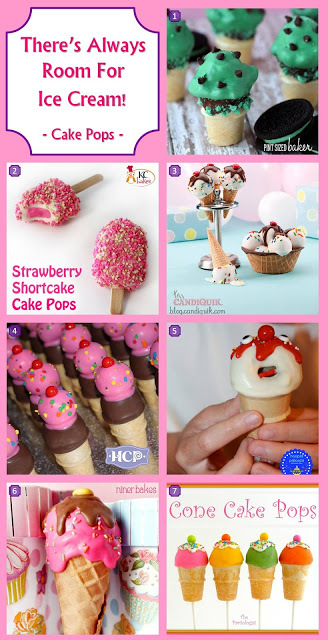 I really want to keep going and showing you the 150+ different pictures of these ice cream cones, but I’ll save that time for you to get started on these As always, thanks for reading! P.S. if you want to make 220 of these things (I do!) 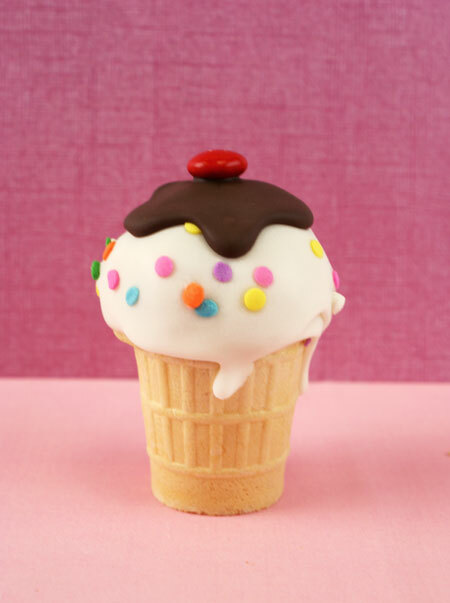 then you can buy actual mini ice cream cones in bulk online here! P.P.S. 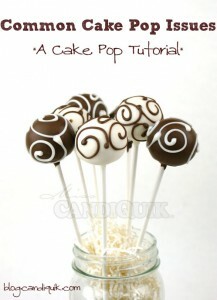 Click here for my cake pop tutorial! Want more ice cream? Check out all these fun ideas from fellow bloggers! 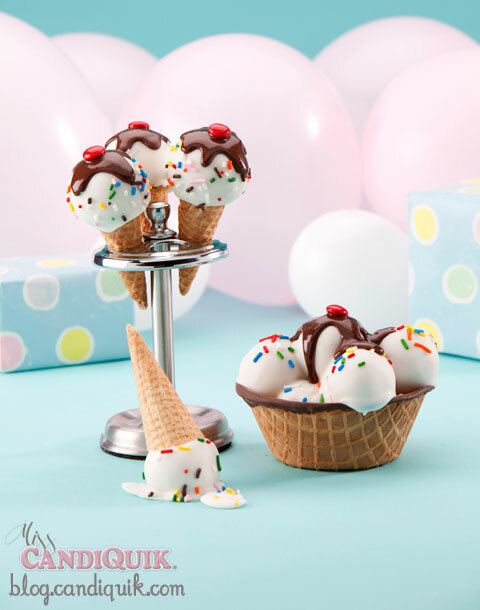 I think my daughter would love to make the ice cream cone cake balls…I’m going to put those on our “to do” list. Oh my, oh my I WANT these! They are so cute!!! Love those little cones and how real they look – great job! Ohhh how I love these! Very awesome blogpost, indeed, so happy we all did this again! Hi Lisa, the waffle bowl is definitely my fav, too! 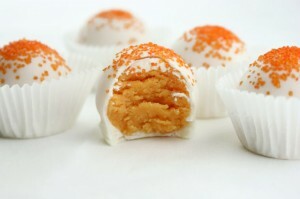 Hi Viviana, si – the crumbled cake is mixed with the frosting and then rolled into balls. I hope this helps. Thank you!